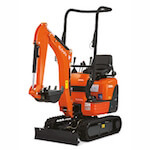 Micro Diggers are idea for fitting through narrow access restricted areas such as alleyways or even doorways yet still pack a powerful digging force. With a fold down Roll Over Protection Frame they can usually go anywhere a person can. 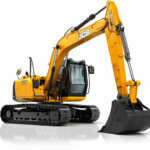 We are also one of the few companies to fit breakers and augers to our Micro Diggers. 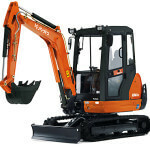 1.5 Ton Kubota Mini Diggers are great for most digging work and are great for driveways or gardens and are even capable of serious concrete breaking with our breaker attachments. We also have augers and post knockers available which make light work of putting up fences. And they benefit from a fully enclosed cab so that you can keep warm and dry on winter days. 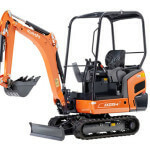 We stock primarily two 5 Ton Diggers, the Kubota U48-4 and U45-3, both are zero swing, both have an impressive 3.39m dig depth and both have serious amounts of power. 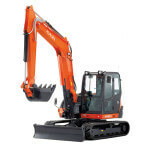 The JS131 is the largest digger that we stock, it is great for digging really big holes and lifting materials, we even stock some machines with a Prolec lifting device which will not allow the machine to lift outside of its working envelope. 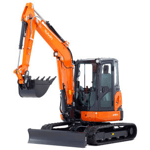 All of our machines come with a full set of buckets as standard and we stock a full range of breakers, augurs and window shutters.